Here are a couple of bentos that I made on different days. Have a nice Monday and week ahead! Sunny Day Pancakes Breakfast For Lunch packed in our Planetbox Shuttle. Mini pancakes stacked (the Planetbox shuttle is quite deep and I managed to stacked three pancakes on each side), seedless red and green grapes. 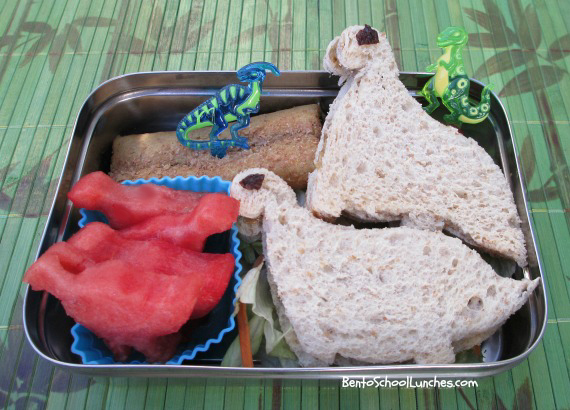 Simple Dinosaurs packed in our Ecolunchbox Solo Rectangle. SunButter dinosaurs shaped sandwiches with raisin eyes on top of a bed of garden salad. Watermelon cut into dinosaurs shapes and a fig bar. Love your lunches, they are cute and yummy! Love those sunnies on your pancakes, so cute! Glad everything went smoothly! Yay....good to hear that all went well as I can understand the feelings! Btw, Cute lunches! 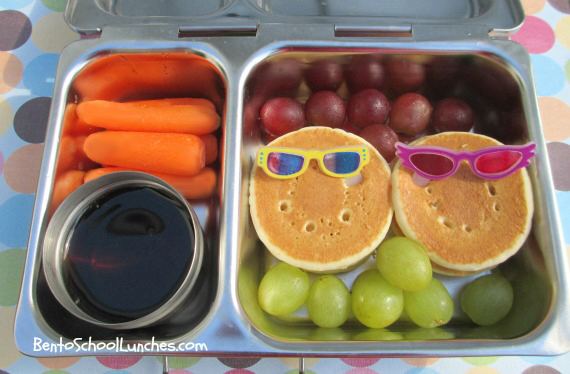 Those pancakes are so cool with their shades on! Thanks for linking up to Meatless Monday!